cognac-one | Alsatian Gewurztraminer gets a HUGE Recognition!! 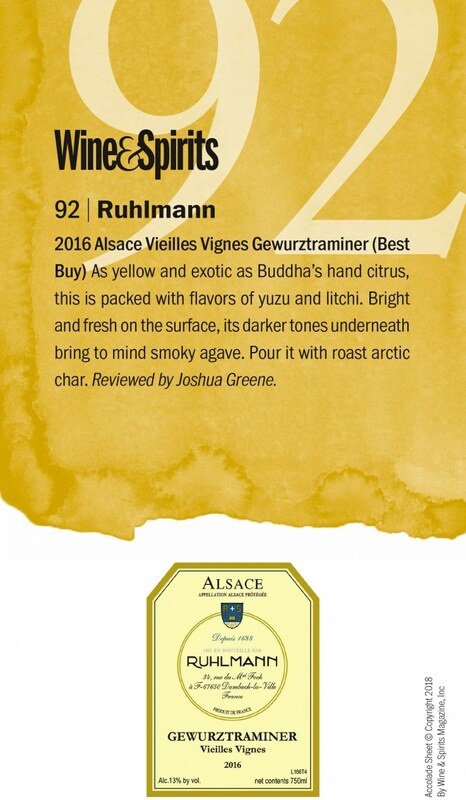 Domaine Ruhlmann from Alsace, France is extremely proud to share that their Gewurztraminer Vieilles Vignes 2016 received a rating of 92 Points from Wine & Spirits! This dazzling wine is also referenced as a “Best Buy“, featured in the April 2018 Edition of the magazine under the “Focus: Alsace” section. #Winefact: These thirty to eighty-year-old Gewurztraminer vines are planted in rich soils of clay and limestone. They are very deep-rooted, producing more limited amounts of small but concentrated grapes. Learn more about this incredible wine Here!